The ACR Lupus Initiative (TLI) offers the complimentary lupus educational resources listed below to medical and health professional schools in an effort to help increase the number of health care providers who are knowledgeable about diagnosing and treating lupus. Short teaching videos—provide a unique opportunity to learn about lupus from experts and hear directly from lupus patients. The resources are also appropriate for teaching more general concepts such as health disparities, management of chronic disease, cultural competence and coordination of care. Please let us know if you have any questions and/or consider utilizing the resources below into your teachings by contacting Stacey Boyd at sboyd@rheumatology.org, or (404) 633-3777 x804. This PowerPoint presentation reviews lupus in the context of childhood, reproductive and postmenopausal years. You can preview a sample of the slides, download a PDF of the full slide-set, or download the full presentation in PowerPoint format. This powerpoint presentation reviews the major causes of morbidity and mortality in lupus. You can preview a sample of the slides, download a PDF of the full slide-set, or download the full presentation in powerpoint format. 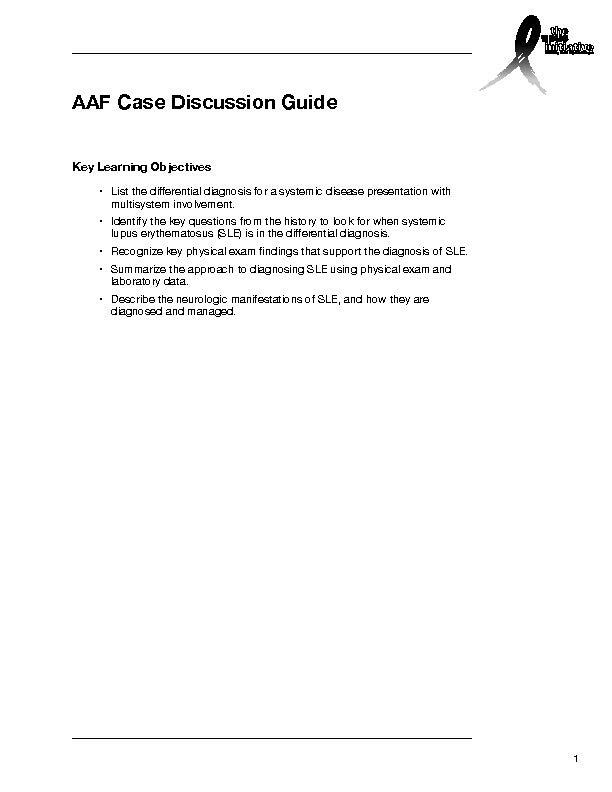 This PowerPoint presentation provides an overview of lupus. You can preview a sample of the slides, download a PDF of the full slide-set, or download the full presentation in PowerPoint format. 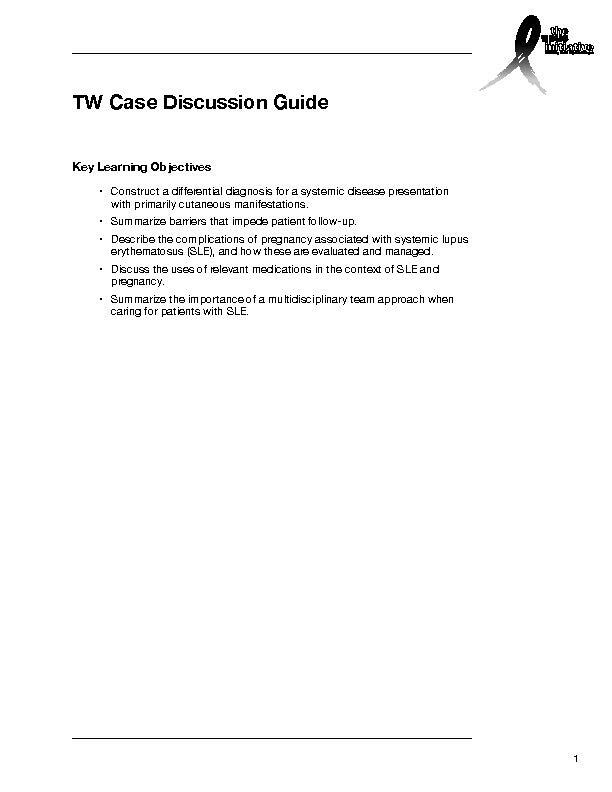 The following supplementary PowerPoint presentation is available to accompany the overview of lupus. 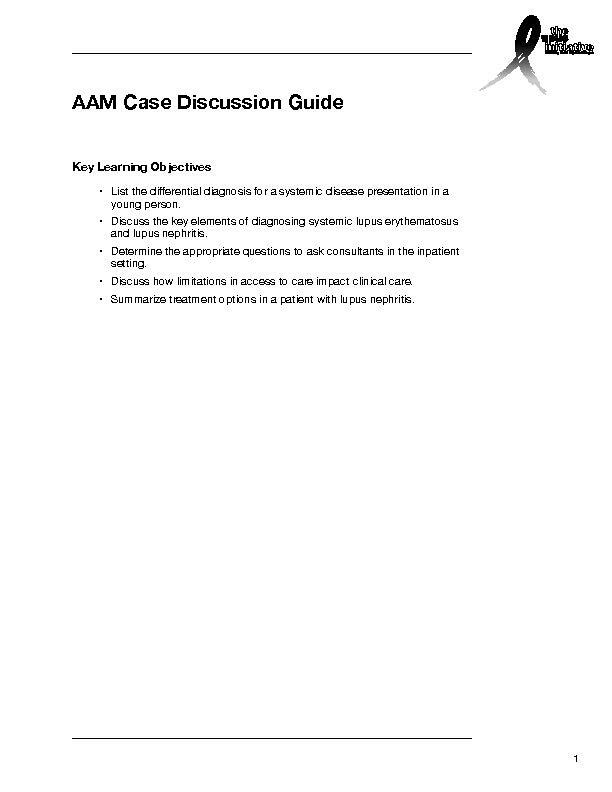 A 34-year-old woman with SLE has come to see her primary care physician for follow-up care. She has been feeling very tired and has gained 10 pounds in the past month. Her ankles are also very swollen. I Don't Have Time for a Headache! A 19-year-old Black man with a history of hypertension, reports to an urgent care clinic complaining of an “on and off ” headache for the past 3 days. This case study involves a 36-year-old Native American woman brought to the emergency department due to progressive breathing trouble. 36 year old female elementary school teacher with history of systemic lupus erythematosus (SLE) presents with new lower extremity swelling and worsening of her lupus rash. Jeannie Johnson is a 22-year-old white woman who has been referred by her primary care physician to a rheumatologist at the medical center in a large city about 50 miles from her home for an evaluation for SLE. Mr. Michael Thompson is a 30-year-old African American man. He presents in the Emergency Room at 10 PM with complaints of fever for the past several days (it has now gone up to 40 degrees C/104 F). 39 year old woman presents with fatigue, fevers, and joint pain and swelling. Why Are My Legs Swelling? A 24-year-old Black woman reports to an urgent care clinic complaining of progressive swelling in her legs for the past month. An 18-year-old Black woman has been admitted to the hospital with fever, fatigue, and dyspnea upon exertion. A 25-year-old Black man presented to the emergency department complaining of fatigue, productive cough, dyspnea on exertion, fever, recent weight loss, myalgias, arthralgias, poor sleep, and a painful rash on his legs. An 18-year-old White, pregnant woman, at 12-weeks gestation is admitted for evaluation of a diffuse skin rash. A 38-year-old Mexican woman presents with complaints of fatigue, nausea, and vomiting as well as weight loss. In this video, Dr. Emily Von Scheven of the University of California, San Francisco School of Medicine defines childhood onset lupus. Four adolescent patients describe their experiences with diagnosis and treatment of the disease. Young patients describe how they prepared themselves for the transition to adult rheumatology care and the challenges they faced, including finding doctors, making appointments, and understanding insurance. Dr. Emily Von Scheven and Dr. Maria Dall’Era, both of the University of California San Francisco, School of Medicine, discuss the importance of preparing pediatric rheumatology patients for their transition to adult care to help them successfully manage their lupus.